The vibration of Numerologicznej Nines is the most mild manifestation of sensitivity among all numbers vibrations. Closing the cycle of Numerologiczny, as the last digit, is full of graceful and melancholijnej reflection on life. It radiates tolerance and patience in respect for all beings and events. The spiritual world of Numerologicznej Nines is silent and inspired faith in the future. The need for peace and distinction, gives a person born in this vibration, natural tact and courtesy. This is also expected from the environment, respect for its clearly placed borders. Nine are accompanied by awareness of the final affairs. He perfectly understands that every conduct and every thought determines the future. Therefore, her vibrations are expressed through humility and constant readiness to serve the needy, be support. He always consoles a good word and will give hope. He can look at the material matters from a distance, reducing the rank of the problem to a level that becomes a solution. Quiet, gentle, looking for contact with space and nature. It is very important for nine moments of loneliness, in which it can experience the beauty of nature. It loads your spiritual batteries in this way. Vibrations Nine, feels the need to be useful and needed. He likes work and effort, each of his actions take with the awareness of the good of the general and performs it very conscientiously regardless of the cost-effectiveness of the attachment. It is the most altruistic vibration for all mankind. He finds himself perfectly everywhere where help is needed which selflessly carries. This person, the first to draw a helping hand, often discreetly, caring not to offend the dignity of the person who is trying to help. He is very competent, he acquires his knowledge constantly through the analysis of his events and other people. Naturally, he is interested in the world, the mystery of life and death, the process of change. He has a great passion for order. Embellishes the outer world, takes care of every detail in the environment. It is the perfect home host, able To organize every project and space. Very important for Nines is the family. I particularly enjoy her good relations between household. It is pleased to observe the development of children and adolescents. It is an excellent listener. By this, it often becomes a confidant of human secrets. It is very loyal, you can be sure that secrets are safe. It shows immense, unsurpassed forbearance for the mistakes of human nature. It treats them as life lessons, it is never allowed to evaluate. Judging people sees as brutality and lack of understanding of the laws of nature. Sometimes, in her actions there is a clear and decisive attitude, which from a choice of mild nature avoids. Thus, it is not a particularly progressive vibration, rather humbly accepting what has offered her fate. It feels a lot of gratitude and does not need to change anything. He believes in God’s opaczność. Nine, in every creature sees the manifestation of perfection. Respects all life and freedom of choice. He does not impose his opinion, he observes the development of events with equanimity. I don’t scare the consequences of wrong choices. No situation, which could be seen as a disaster, does not precipitate from a sense of trust in the process of life. 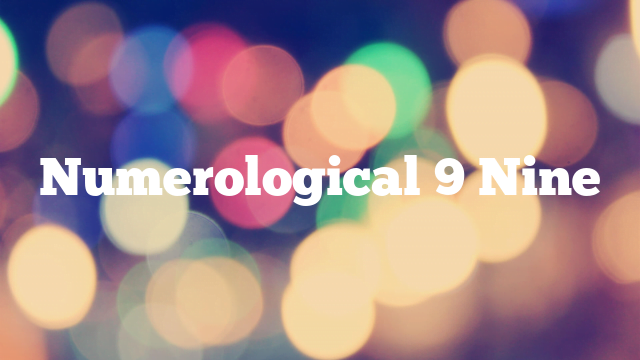 Numerologiczna 9 manifests a passion for beauty which he finds in nature, art and literature. Very appreciative of the products of beautiful, has excellent hand-made collector’s taste. It is usually very elegant. It manifests the artistic abilities that often become her hobby. Nine, it has a very established and specified value system. There is very ethical real annoyance, it makes her lack of respect among people, very ill tolerates lie, intolerance. His attitude teaches integrity, stimulates reflection, inspires proper conduct. He finds himself perfectly in charitable activities. As an employee, one can be sure of its commitment and loyalty but also, brings its expression to a friendly and benevolent relationship. In the eyes of nine, all men are equal and each possesses their dignity. It desires that noble reflexes and human values survive and develop from generation to generation.